So, it's that time of year again, that everywhere seems to be getting their Christmas items in stock, one of my favourite places for limited edition items is Lush, they always seem to be the first out with the seasonal items so they get my excitement kicked off! 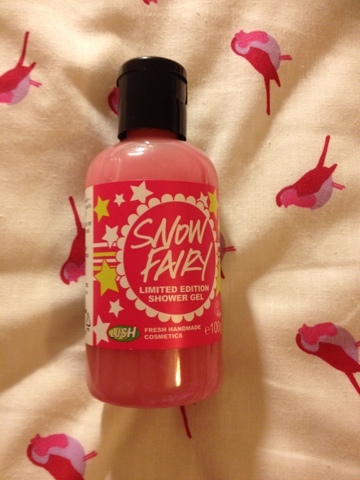 One of my favourite items is Lush's Snow Fairy Shower Gel (it used to be labelled as a Shower Gel and Shampoo but seems to have changed this year). This is a bubblegum pink shower gel with tiny little bits of iridescent glitter in it, these don't really tend to transfer onto the skin though so I think it's just to make it look pretty in the bottle! The scent of this is to die for, it's very sweet so if you're not a fan of sweet scents then this probably isn't for you, it's a mixture between bubblegum and pear drops, this smell, to me it's like heaven, I think it's partly because Christmas is my favourite time of the year and I've started to associate the smell with Christmas now (along with Toffee Nut syrup from Starbucks!!!) They've also changed the packaging of this, this year and instead of the standard black label with white font, it's a pink label with pretty little stars on it. There are a variety of different sizes of this, I have the big bottle in my shower which is £10.25 for 500g which is quite expensive but you only need a little bit of this to get a nice big lather and the smell lasts on your skin for aaages, I can still smell it in the evening after I've had a shower that morning. I'm going away tomorrow so I had to pop in and buy a little mini bottle (100g) which was £3.50 so that I can smell of this on holiday as well. Have you guys used Snow Fairy? What are your thoughts? Any other good Christmas products from Lush? 2 comments on "Lush Snow Fairy Shower Gel"